The Holiday Season is nearly upon us and with it images of sweet treats and savory snacks come to mind. One of my fondest memories of the season was to help my mother bake up all sorts of sweet treats to share with friends and neighbors. This tradition carries on in 4-H through our annual Holiday Bake-off where adults and youth are encouraged to work together to create a delicious baked good. This is not a traditional 4-H contest where the youth member must do all the work themselves, but rather a team project that involves both adults and youth. Entries will be judged on appearance, taste and display. Cloverbuds are eligible to enter the contest, but will not be judged and will receive a participation ribbon. Each entry will earn either a blue, red, or white ribbon and are not categorized by age division. One overall winner for each category will receive a coveted Golden Spoon. The overall winner of the Holiday Bake-off receives the honor of bringing home the Giant Golden Spoon and prize! All entries (after awards) will be sampled during the Holiday Party. NO LIVE PLANT MATERIAL (SUCH AS HOLLY, POINSETTIA, BOXWOOD, ETC.) may be used – entry will be disqualified. Mixes, precooked, and non-cooked items may be used in the finished product. Work should be done by the youth with supervision, directions and help of a caring adult. Entries must have a festive holiday appearance along with a list of ingredients. Only one entry per child per category. Completed entry forms must accompany your food item. The 4-H agent reserves the right to re-classify an entry if needed and participants will be informed as soon as possible. One recipe card for each entry must be submitted so that everyone may sample the food item after the awards presentation. Adults are invited to enter our Chili Cook-off as part of the fun with the kids deciding the winner by casting their votes. To be a part of cook-off, just bring your best recipe with you to the Holiday party and the rest will be provided by the 4-H office. 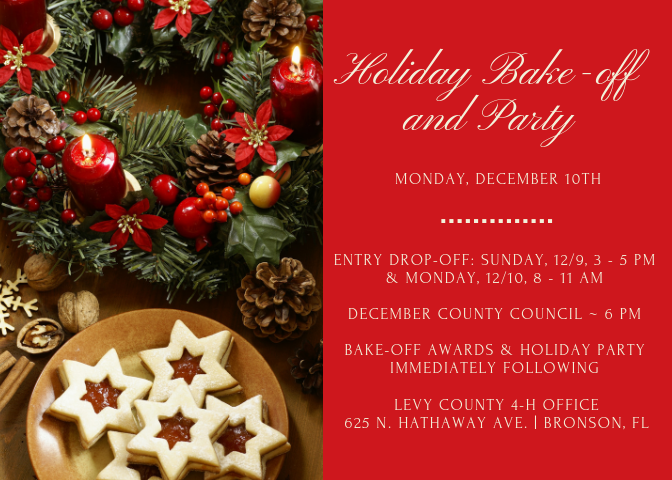 Holiday bake-off awards and party immediately following the County Council meeting. Animal Adventures 4-H Club is hosting an ornament contest. For details, contact Shawn Royce. The kids attending the Holiday Party will judge the best chili entry at our 2nd annual Chili Cook-off. So, bring your best chili recipe and let the kids have fun deciding who’s the winner! Click here for the 2018 Holiday Bake-off Entry Forms. Genevieve Mendoza is the 4-H Youth Development Agent for Levy County, FL. She specializes in camping and citizenship/leadership.